If you are providing care for a loved one with dementia, you are no doubt dealing with their medications as well. 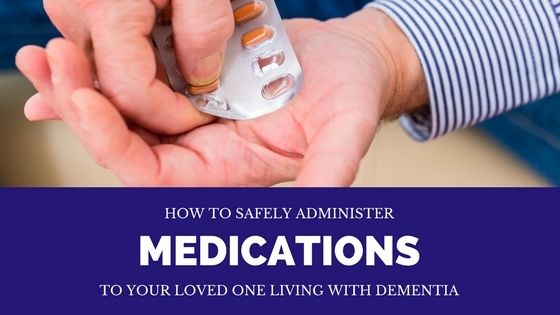 While this is a major topic to discuss, we will briefly touch on some of the important things to remember when administering medications to your loved one living with dementia. If you have further questions regarding this topic or the issues discussed below, please speak with your loved one’s physician. There are two issues that primarily need to be covered. The first is safety issues regarding medications. The second is actually getting your loved one to take the medications. Here are a few tips from the experts on medication safety both in the home and regarding determining what meds will need to be taken. It is important to recognize that your loved one is probably taking or at least has several medications prescribed for their dementia and various other conditions they may have. Be sure you are coordinating with all care providers. It is also best to have all prescriptions filled by the same pharmacy so that they will catch any drug interactions that would be dangerous to your loved one. Know if your loved one has any drug allergies and if so, to what and what kind of reaction they have to that medication. There is a difference between a true “allergy” which can cause swelling (even in the throat) and difficulty breathing and simple unpleasant “side effects” such as changes in stools or a lack of appetite. Be sure you carry a list of their medications with you when taking them to the doctor, especially new doctors. Always find out as many details about the new medication as possible, what it is for, what the possible side effects are and the things that should be reported to the doctor. Be sure you know if the medication is to be taken before meals, with meals or after meals. Keep the medication in a pillbox, divided by day and time of day it should be taken. The pillbox and extra medications should be kept where your loved one cannot access them. Keep instructions very simple if even needed at all. Remember that the more you talk when you want them to do something, the more likely it is that you have confused them. Set up a happy routine. Often it is best to just say something like “It’s almost time for ice cream” then hand them their pills one at a time with a small lightweight glass of water, while saying nothing else. Usually the person will take the pills. If you don’t comment or get into an argument, they have no reason to fight you. As soon as the pills are swallowed, give the ice cream as a treat and tell them what a great job they did. As the dementia progresses, you may have to provide cues at each step, such as telling them to “put it in your mouth,” and “now take a sip of water” and finally, “now swallow the pill.” He or she may also need physical cues such as touching the hand that is holding the pills to draw attention to them. Make a schedule. Your loved one will likely do better with everything on a schedule as it provides structure for them and helps them to relax. If there is someone your loved one respects, tell them that “so and so wants you to take your pills.” Most of the time trying to reason with someone with can result in frustration so it isn’t usually recommended. If your loved one seems to have difficulty with a specific medication try seeing if it can be formulated differently. Maybe as a patch, gel or cream or liquid. If all else fails, many medications can be crushed and given in ice cream or other sweet things. Be sure to check with the pharmacy to be sure that the particular meds you have can be given in foods, or crushed. For more detailed information on how to get your loved on with dementia to take meds and how the different tastes can be disguised, click here.